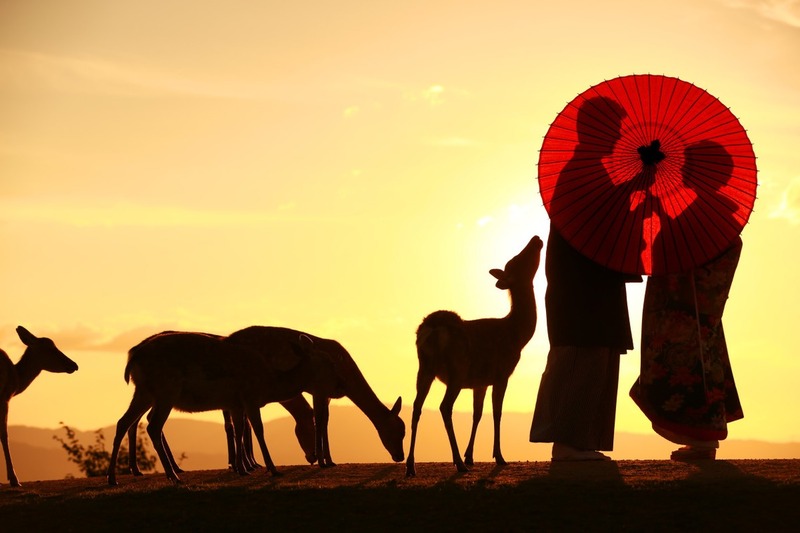 Nara is home to many traditional sites and areas for visitors to experience. 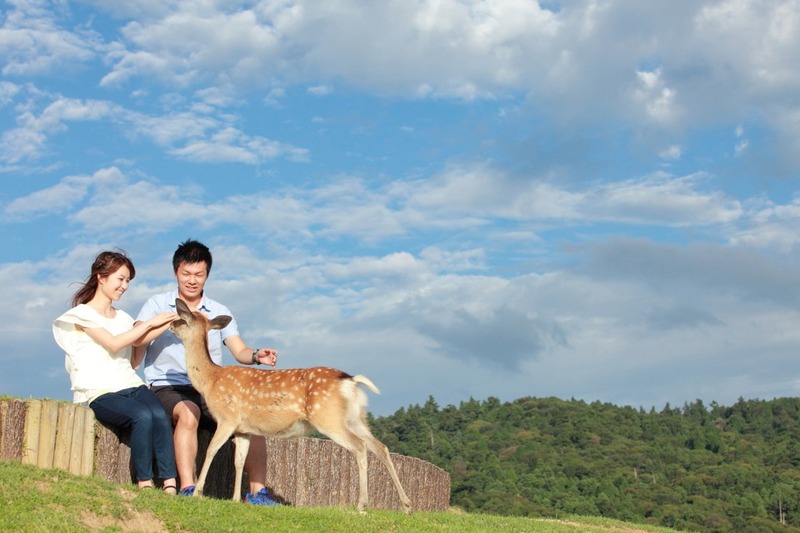 One of the most popular is Nara Park as it is home not only to beautiful temples but also adorable wild deer! Yes, the deer in the parks are not domesticated and actually leave the park at closing time to go home. 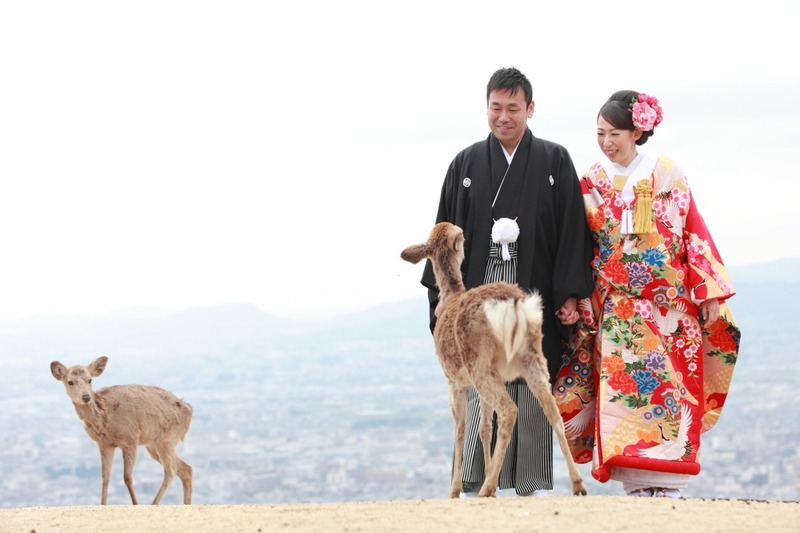 Aside from the cute deer, Nara has a variety of unique sights and activities to experience in each season, and is a highly recommended photo shoot location for couples. Visitors can expect to see beautiful sakura in the spring time in Nara (late March to early April). The blossoms only bloom for about two weeks so parks may be busy at this time! 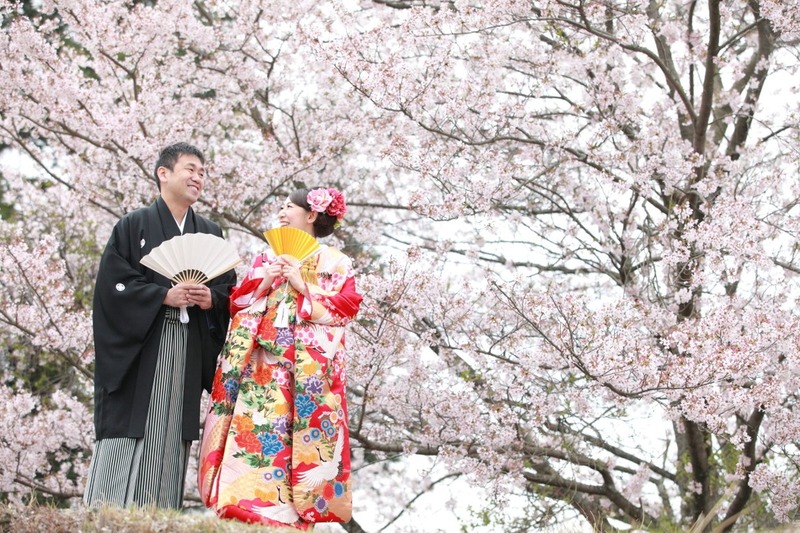 A very popular shot among couples is standing under the cherry blossom trees while the petals are falling. 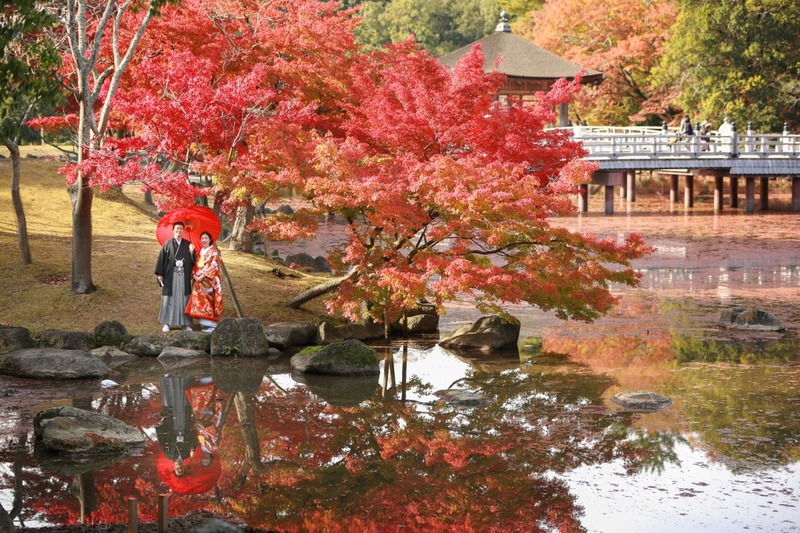 Autumn is a nice time to visit Nara as the temperature is cool but not too cold. 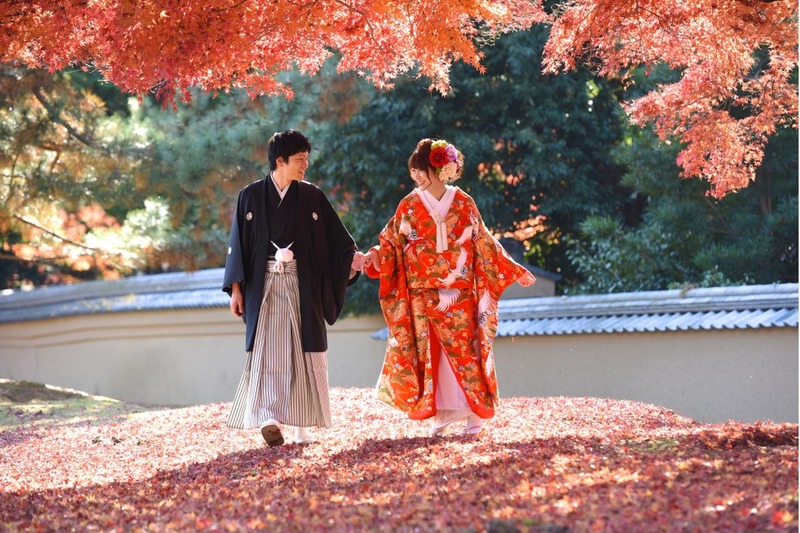 This kind of weather is perfect for couples looking to rent wedding outfits such as dresses or kimonos! 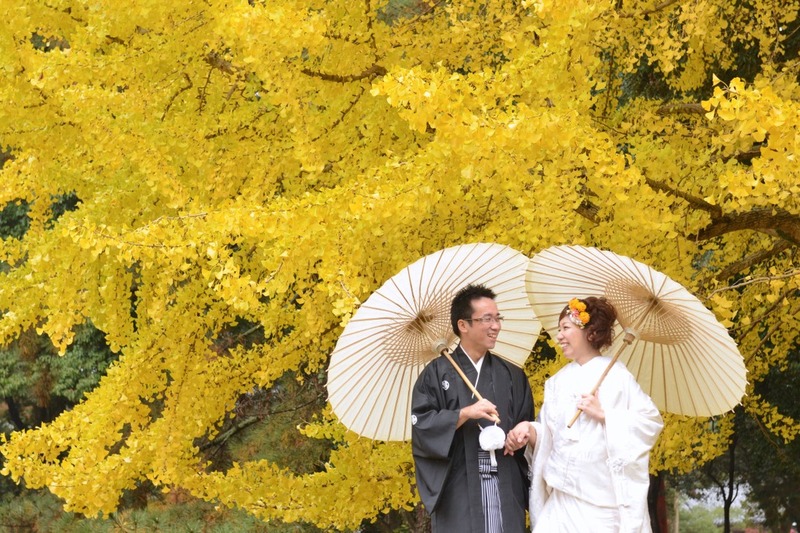 Matching perfectly with red or white wedding kimono, the autumn season offers a beautiful backdrop of reds and yellows. Over the years, the deer at the park have learned to bow when asking for "shika senbei" (deer crackers). Fun for visitors of all ages, it is one of the most highly recommended activities in the park. Silhouette shots like this are especially popular with "wagasa" (Japanese style oil-paper umbrellas). Add some yellow to your photos to brighten up the mood! Another popular background during the autumn season is the yellow leaves such as the ones pictured above. Wedding kimono match perfectly with natural and traditional backgrounds like this! 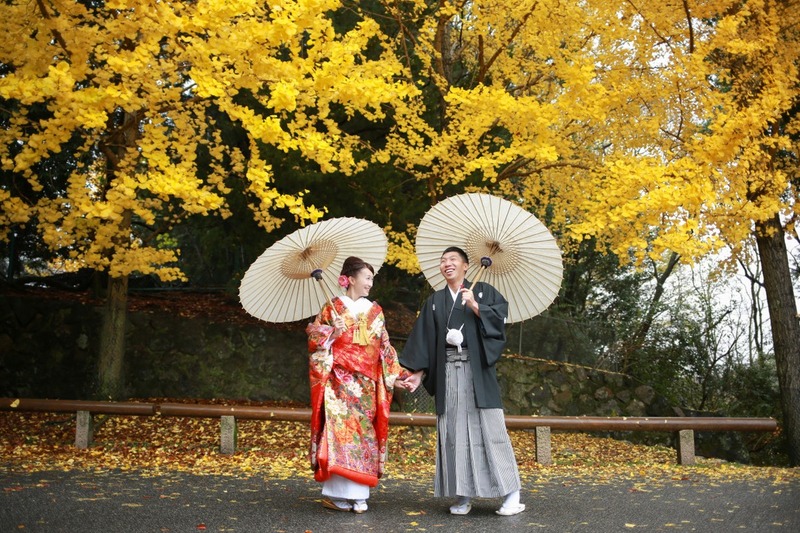 Many photographers offer rental kimono in their packages, or you can ask for rental store recommendations upon booking. There are thousands cherry blossom trees throughout the land of the rising sun, Nara Park is home to about 1700! Around 1200 deer come down from the mountains to mingle with their human friends (and for some deer crackers) every day at Nara Park!